Douglas Wooley "Dixie" Parker, born April 24th, 1895 in Forest Home, AL, was a professional baseball player from 1918-1941. He was a resident of Little Rock, AR, from about 1915-1920. 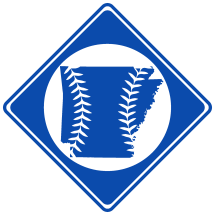 Parker grew up in Alabama1 but moved to Little Rock with his mother around 1915.2 He attended Little Rock College and in 1918 was given a tryout with the Little Rock Travelers before beginning his professional baseball career, which parts of four decades. 1. 1900 U.S. Census and 1910 U.S. Census. 2. Parker's mother Fannie Parker (widow of William A. Parker) first appears in Little Rock city directories in 1915. Fannie and Douglas appear living in Little Rock in the 1920 U.S. Census.